The winners have been named in the prestigious Reece Bathroom Innovation Awards in Australia. Both winners - in the professional product design category and the student design category - won for their modern bathtub designs. The professional winner, Justin Wagemakers of Blue Sky Design Group, designed a modern, freestanding bath with clean lines and versatility. Called "Bathe," the design "allows for the user to accessorize it to suit their needs," according to BathroomInnovation.com. The student winner, Toby Nowland, won acclaim for his design called "Eggshell Bath." It "follows the form of an eggshell, sliced into an asymmetric vessel and designed to fit the human body perfectly. Lighting is built into the base of the bath which shines through the water creating and projecting reflections on the inner walls surrounding you," according to the website. 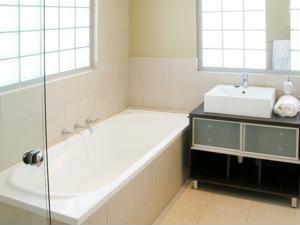 Contest officials say the fact that two bathtubs won highlight the fact that tubs are becoming the centerpiece of modern bathroom designs. "The bathtub is taking on a new form within today's modern home," Wagemakers told Architecture & Design magazine. "New materials, production methods and customer needs are starting to transform the known bathtub into a new medium of relaxation and comfort. Designers are starting to see these opportunities and are creating some fantastic results."